While the latest Pew Research Center survey suggests that Barack Obama has an uphill battle if he wants to win over public support for military airstrikes in Syria, there are signs that opinions may have shifted over the course of the weekend. Most notably, the share of the public who said Obama has explained his case for airstrikes clearly improved from 27% in interviews conducted Thursday and Friday to 38% in interviews conducted Saturday and Sunday. Yet while Obama may have explained his position more clearly to some, there are no signs that the effort raised overall public support for military airstrikes. Rather, what was a 19-point margin toward opposition on Thursday and Friday (47% oppose, 28% favor) remained an 18-point margin over the weekend (48% oppose, 30% favor). 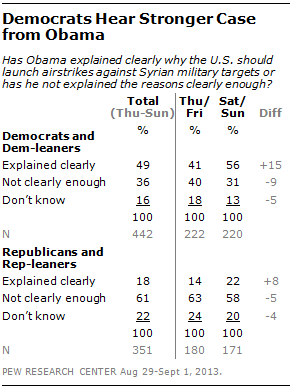 Democrats, in particular, increasingly said that Obama had clearly explained reasons for conducting airstrikes. In interviews conducted Saturday and Sunday, Democrats and Democratic leaners felt Obama had explained his argument for airstrikes, by a 56% to 31% margin. That was a substantial improvement compared with Democrats interviewed on Thursday and Friday, who were split as to whether Obama had (41%) or had not (40%) explained his case clearly. Republican opinions about whether Obama had clearly outlined the rationale for airstrikes also improved, though most Republicans and Republican-leaning independents (58%) continued to say that Obama had not explained his reasons clearly enough. Meanwhile, the overall support and opposition to conducting military airstrikes held steady because of countervailing movements across partisan lines. Over the weekend, there were signs that the share of Democrats favoring military airstrikes may have grown slightly (from 29% to 37%). Republicans and Republican leaners were divided over airstrikes in interviews conducted Thursday and Friday (34% favor/39% oppose). 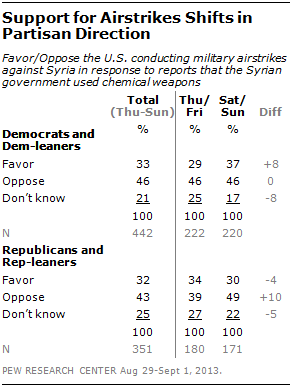 By the weekend, significantly more Republicans opposed airstrikes (49%) than favored them (30%). 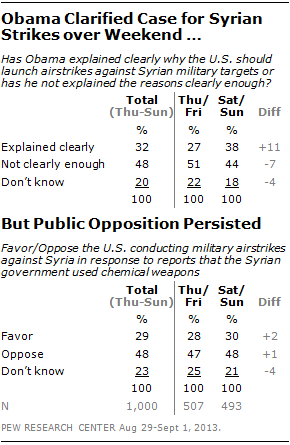 It is worth noting that for the entire field period, 23% offered no opinion about U.S. military action in Syria, a figure that did not change much through the weekend. Overall, this poll, conducted just days after Obama administration officials raised the possibility of airstrikes in Syria and as the president announced he was seeking congressional approval, captures the public’s first take on this issue. These short-term movements suggest that public opinion is fluid and may shift as the debate over military action continues. The Pew Research Center will track opinions about Syria in the weeks ahead.